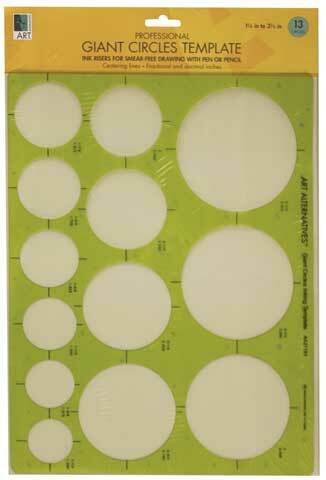 Made of flexible, durable 0.03" transparent green plastic with a matte finish on one side to reduce glare," to beginning of description, this template contains 13 circles ranging from 1-1/4" to 3-1/2" in diameter. It includes fractional and decimal inch markings, centering lines for precision placement and built-in ink risers for smear-free drawing in pen or pencil. The allowance on all openings is designed for use with .5mm pencil lead or pen point.